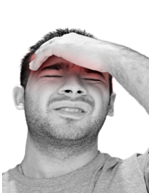 A migraine headache generally consists of intense pain that manifests in various areas of the head, some of the common symptoms that accompany migraine headaches include nausea, sensitivity to light and sound, irritability, and lack of ability to perform work and daily activities. Whether you exhibit the classic signs and symptoms or you have very specific migraine related problems, you may find yourself shutting down your life until the migraine subsides. Many of our patients often describe the stress and frustration associated with the uncertainty of when their next migraine is going to strike. This uncertainly leads the very stress that often they feel sets off their migraines. At the Milwaukee Acupuncture and Health Center, we provide a very unique and sensible approach to the treatment of migraine headaches. We spend time with each of our patients to understand their migraine symptoms. By listening and asking the proper questions, our practitioners are able to design a customized treatment plan that manages the symptoms of the migraine as well as the underlying causes (stress, muscle tightness, tension, hormone imbalances). Please give us a call NOW at 414 727 4640, we may discover an effective, natural solution for you.